The personal is not only political, it's also economic and sexual: as a society, we're encouraged to view economics as objective science far removed from us--when in reality it has concrete and far-reaching effects on our everyday lives. 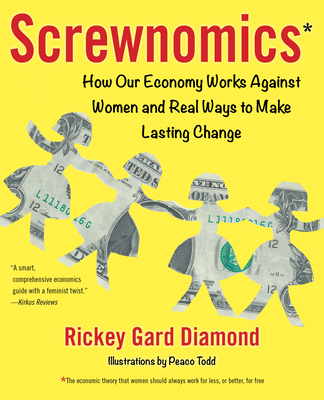 In Screwnomics, Rickey Gard Diamond shares personal stories, cartoons, and easy-to-understand economic definitions in her quest to explain the unspoken assumptions of 300 years of EconoMansplaining--the economic theory that women should always work for less, or better for free. It unpacks economic definitions, turns a men-only history on its head, and highlights female experiences and solutions. encouraging female readers to think about their own economic memoir and confront our system's hyper-masculine identity. In the past fifty years, the US has witnessed a major shift in economic theory, and yet few women can identify or talk about its influence in their own lives. Accessible and inspiring, Screwnomics offers female readers hope for a better, more inclusive future--and the tools to make that hope a reality.